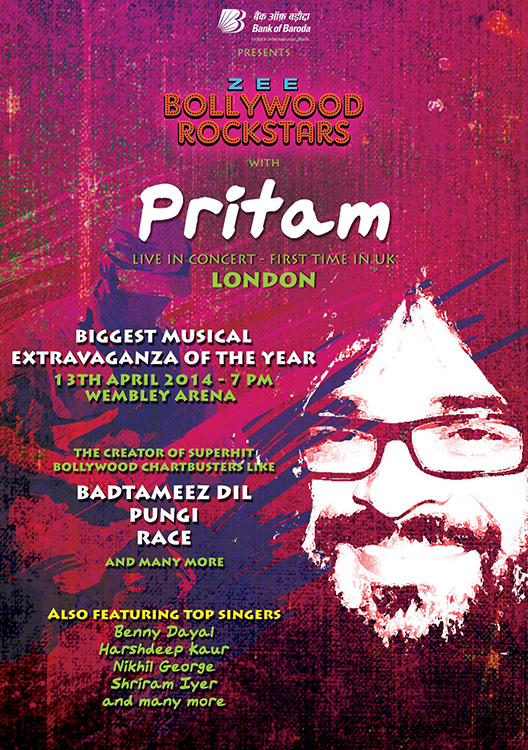 Pritam has become an unstoppable force on the Bollywood music scene in the past few years. His steady flow of chart toppers and the frequency and ease he drops them on people is something that is pretty much incomparable to any other music director. Nikhil George – Aashiyan from Barfi! I have always wanted to play in London. I genuinely love the city. Given the large Bollywood music lovers there, I am eager to play in front of them and am looking forward to the show. To top that, it’s a dream venue like Wembley Arena. It’s a great feeling. Excited. Yes, Wembley Arena is a historical venue for music. I remember the epic Queen show at the Wembley arena and Wembley stadium. Also, I have followed bands like U2, Meatloaf, Corrs, Pink etc, performing at Wembley Arena . – What is it like for you to be performing at the same stage? I feel honoured obviously. It is one those arenas and venues you dream of playing in, as an aspiring young musician. The legacy and history makes it really exciting for me to perform there. I have completed a decade in Bollywood scored for 100 films with films like Dhoom 1, 2 3, Gangster, Metro, Jab we met, love Aaj Kal, Bhoolbhulaiya, Race, billu barber Once Upon, Barfi, cocktail, Yeh jawaani etc . By God’s grace I have more than enough number of songs to keep everybody entertained (smiles). I am planning to perform songs which has been appreciated by my audience over the last few years. So ya, from the romantic ones to the peppy ones. From Sufi to Dance. From guitars to Dhol. Trying to incorporate a little bit of everything. I will be doing a combination of the chartbusters and popular songs mixed with some of my favourites. For the final list however, you will have to wait till 13th evening (smiles). A few popular Bollywood playback singers are accompanying me . They will be featuring with me on 13th April. Benny Dayal for example, is the most sought after singer nowadays . He has rocked last year with his rendition of my song Badtameez dil and lath lag Gayi. He will sing lot more. 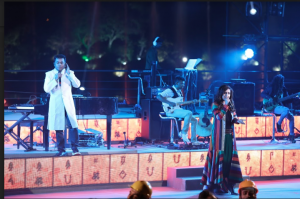 Harshdeep Kaur needs no introduction to UK audiences, as she has performed there before. The magic of her deep voice will keep the stadium ringing. She is my favourite Sufi voice – no wonder everybody calls her Sufi ka Sultana. She will sing songs like Kabeera, Jugni etc. Aditi Singh Sharma is a rockstar. She’s a performer to look forward to . She will definitely create “Dhoom” with her performance. Then there’s my friend Nikhil Paul George joining us who sang Aashiyan main kya karoon in Barfi. He has a addictive voice. Shreeram Chandra actor singer winner of idol has a magical voice. He sang songs in Yeh jawaani for me. Soham Chakraborty has been a part of my band Metro since the Life in a metro days. And about the full performance, let that be a surprise! I have been associated with Zee from a long time. From Sa Re Ga Ma to Zee Cine Awards. And experiences have always been overwhelming. I am happy to be associated with Zee again. Looking forward to something equally exciting. 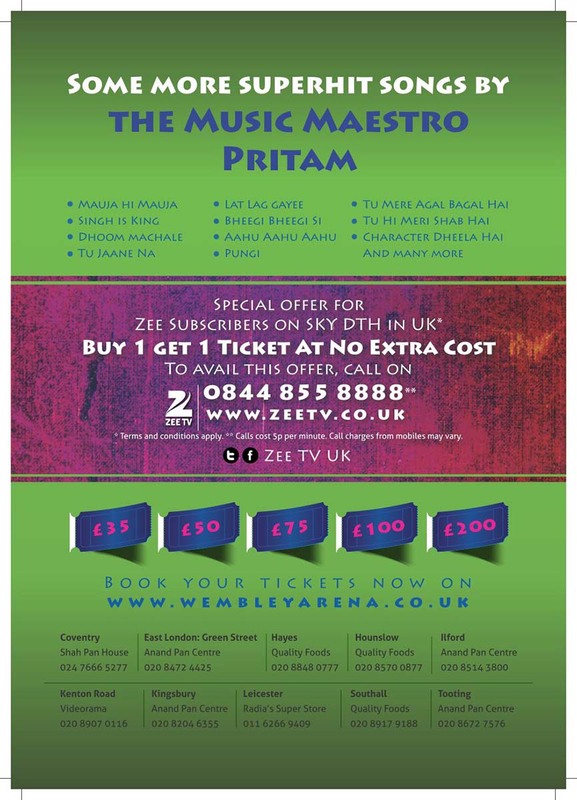 Let us know your favorite Pritam songs in the comment section below!